At the request of Spanish lawyers, Alan Cantos and José Molto, Garden Court International barristers, along with other chambers and the Bar Human Rights Committee (BHRC), wrote an open letter to Mr José Antonio Griñán, Chairman of the Spanish Socialist Workers’ Party. The letter raised concerns about proposed changes in a Bill which aimed to limit the jurisdiction of Spanish courts in respect of international crimes. Spain is one of the few remaining true universal jurisdictions left in Europe where cases of mass atrocity can be brought against those considered responsible who may not face justice in their own jurisdiction. The proposed changes would mean that those considered responsible for these crimes would go unpunished, leaving victims without reparation and perpetrators with impunity. Garden Court International is pleased to learn that the letter encouraged the Socialist Party to challenge the constitutionality of the Bill to Spain’s Constitutional Court. The letter came as a result of a talk on 4 March 2014, when Garden Court International and the BHRC co-hosted a talk on a universal jurisdiction case in Spain. The case in question indicted various leaders of the Communist Party in China for genocide in Tibet. 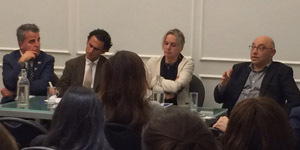 At the talk, Stephen Kamlish QC of Garden Court and Kirsty Brimelow QC of Doughty Street Chambers were joined by the Spanish legal team, José Molto and Alan Cantos. The talk aimed to increase awareness both of the alleged crimes in Tibet by leaders of the Communist Party in China, and of the Bill that was being considered in Spain which would limit the Spanish courts’ ability to apply universal jurisdiction to cases of war crimes, crimes against humanity and genocide. Garden Court International’s letter, drafted by Paul Clark and Marie Moodie, is available on the BHRC’s website.